We played this game on our Youtube Channel! Took longer than we thought to beat it but we were commit ed! man I got so close to getting all the candies, had a lot of fun playing it still, great job devs! Awesome game! Very unique game mechanic and well done visually. I was close to finishing but only able to get 7 candies. This game is so refreshing! Truly a unique game! I want more games that try new ideas like this! Awesome game devs! If you haven't check it out! Had a great fun playing the game. I only wished maybe the mouth would open a bit wider since it was a bit hard to see sometimes where i was heading imo. But regardless of that it was a nice fun game, good job! lol loved the game made my voice sore! This has really taken off by the way. Its the last one I played Interesting mechanic just a bit problematic playing it while having dual monitors but aside from that really well done I dig it. This game was so well made with such good mechanics! Sadly, I didn't find all the candy but I had so much fun! Haha I'm glad it lived up to your expectations! :) Thanks for playing!! This looks hilarious! 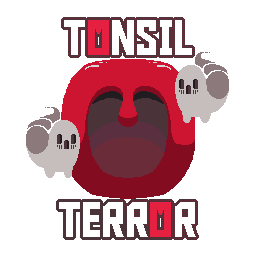 Really love that Tonsil Terror logo too!